The Dundalk Kota Sauna is perfect to use all year round at the Cottage, chalet or backyard. The beautiful Western Red Cedar wood of the walls not only gives it a wonderful appeal but has that terrific aroma we all love to smell. 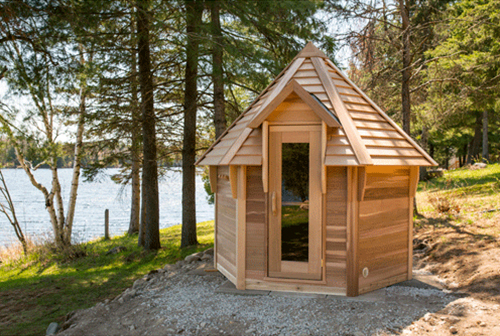 You will enjoy many hours of relaxation in this Canadian Cedar Kota Sauna made for you and your family. The Dundalk Kota Sauna is perfect to use all year round at the Cottage, chalet or backyard. The beautiful Western Red Cedar wood of the walls not only gives it a wonderful appeal but has that terrific aroma we all love to smell. You will enjoy many hours of relaxation in this Canadian Cedar Kota Sauna made for you and your family. It has easy to access high benches that are made for sitting down during the sauna, optional wood burning or electric heaters quickly heat the sauna in under 30 minutes. Available in 2 convenient sizes and shipped to your door in easy to assembly kits with quality assembly instructions and all required hardware included. Handcrafted and easy to assemble kits built with quality Canadian Red Cedar. Triple layer roof is standard and consists of inside cedar, ice and water shield and your choice of exterior. Bronze tempered full height glass in the sauna door with solid wood handles and magnetic closure. All Kota Saunas feature a bottom step and upper level bench made with clear red cedar. Clear Red Cedar Bevel Siding Roof has ice and water shield underneath. Clear Red Cedar Shingle Roof has ice and water shield underneath. Asphalt shingles are available in many color to match your surroundings. Upgrade your sauna with our large selection of additional options. Harvia Wood burning heater is available in the larger 10' model only. Easy to Assemble in 4 to 6 Hours.